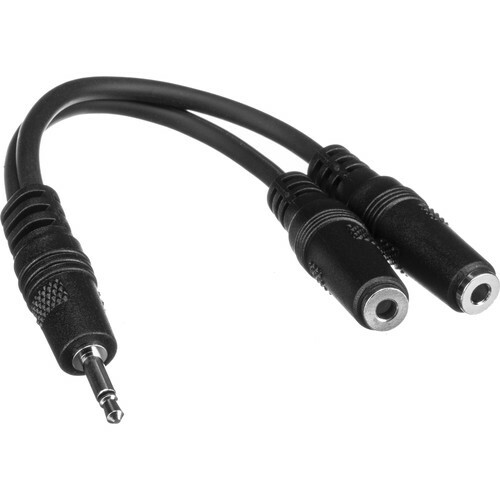 This Comprehensive MP/2MJ-C Mini-Phone Male to Two Mini-Phone Female Mono Y-Cable is a general purpose Y-adapter that can be used to split a single mono line signal into two separate signals. Box Dimensions (LxWxH) 7.0 x 4.0 x 0.2"
MP/2MJ-C Mini Male to Two Mini Female Y-Cable 6" is rated 5.0 out of 5 by 1. Rated 5 out of 5 by Mike from Exactly What I Was Looking For... I have been looking for this Y cable for a long time and finally found it on B&H. I primarily use this cable to fire my 2 Canon 580EX II or Yongnuo 560 speedlights (available on @) using a PocketWizard Plus II wireless trigger. This is definitely a money saver for me. PocketWizards are great but way overpriced for what it has to offer. I highly recommend this cable; this cable is hard to come by since most manufacturers produce stereo splitter cables not mono signal which the PocketWizards utilize.